So, what can you say about Castlevania as a series? Well, it definitely has its memorable moments in history, like having some of the hardest games of all time, reinventing itself with a new gameplay style on the PS1, and having some rough areas in its career by going 3D. It falls into the mold of having a bumpy, but good history of games. When I was growing up as a gamer, my taste really didn’t lean towards Castlevania, due to the high difficulty of the early games and the Metroid-style gameplay in the later games. I guess you can say this series is definitely an acquired taste, but I know a lot of people like the series, which is fine with me. In 2008, I saw a trailer for a game called Lords of Shadow. It looked interesting, but somewhat familiar, with the whole flame whip to Castlevania. 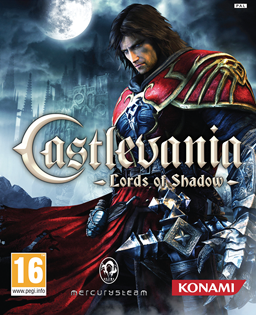 At E3 2009, Konami then finally revealed that Lords of Shadow was turning into Castlevania Lords of Shadow. I was stoked. It looked amazing, it sounded amazing with the narration being mostly done by famous actor Patrick Stewart. We didn’t get a lot of info after that, which sucked, since I really wanted to know more about the game. I then read some info, finding out that it was going to be a revamp of the series. At E3 2010, we FINALLY got some more info about the game, and actually got to see a demo of it. Sadly, I had to wait, but I enjoyed the demo. Then, I preordered the Limited Edition version for my PS3. A few days later, I got it and now I am ready to review it. I know it’s been awhile since the game was launched, but I wanted this game to be special since I really do love this game. Yeah, it has some rough areas, but what game isn’t like that? Either way, this isn’t a game that should be skipped. As a revamp goes, it is a very good one. Let’s dive into the dark catacombs of Castlevania Lords of Shadow. The story of this revamped number in the franchise starts us in the year 1047. The Lords of Shadow have made the land unbearable with nightmarish creatures all over the land, taking lives and in some cases, turning them into one of their own. In comes our main character, Gabriel Belmont. He is part of the Brotherhood of Light, and he travels across the land to find and defeat the Lords of Shadow to find the Mask of the Gods in order to bring back his deceased wife. While this is all happening, the story takes some pretty dark tones, like, is Gabriel doing the right thing? Are Patrick Stewart’s character’s good intentions actually good? Did Gabriel actually kill the people he does in the game? It is definitely a much darker-toned story, and I like that. I might not have played every single Castlevania, but from reading and watching walk-throughs, the stories can be a little silly, and well, not that good in my opinion. I think a darker tone was needed in the series, and boy, was it dark. The ending isn’t really happy, either. The gameplay featured in Lords of Shadow is a hack-and-slash action adventure game where you use your main weapon, the Battle Cross, as a whip to take out multiple kinds of creatures throughout the game. Yeah, the gameplay can be a little bit like God of War, but people who keep comparing it to like this, just SHUT UP! See, here is my argument, which basically makes your argument pointless. The argument goes like this, “ Oh, Castlevania Lords of Shadow is copying God of War, oh, wait, God of War is copying Rygar, oh, wait, Rygar is copying Devil May Cry, oh, wait, Devil May Cry is copying Soul Reaver, oh, wait, Soul Reaver is copying the old-fashioned Castlevania games!” See? Other games will take parts of popular games in that genre and implement them with their own mechanics, so just stop with this whole “ oh, he is copying that game and such”. Anyways, back to the game. You can use the Combat Cross to do multiple things with upgrades you gain throughout the game, like a piece to use as a grappling hook, a metal steak for vampires, and the chain just having more attack power. There are four side weapons in the game, the first are daggers that are used as your basic throwing weapon, the second are fairies that can be used as decoys so you can focus on certain enemies and distract others, and the third is holy water that is thrown at an arc and does a small explosion. The final weapon is a purple crystal that can be used to get rid of a ton of enemies or severely damage a boss, but is the hardest to obtain, so keep it for boss fights. During the game, you will find relics, like the boots from Cornell, to ram and dash across the ground, the gauntlet from the Dark Knight to smash walls and push objects, and the wings from Carmilla to give you an extra boost to your jump. The other main gimmick of the game is the light and shadow magic you can use in combination with the secondary weapons, relics, and your Combat Cross. Light magic will heal your health for each successful attack landed. Shadow magic increases your attack power. The magic system will become required to beat some enemies and bosses faster, and definitely comes in full swing during the final few boss fights. Another main part of the game are the titan fights! There are sadly only three of them, but they are probably some of my favorite parts of the game. Just treat these fights like you would when playing Shadow of the Colossus. The graphics for Castlevania Lords of Shadows are outstanding, and it is definitely one of the best looking games from 2010. I just love the whole dark gothic look of the game, and it truly feels like a Castlevania game with mostly dark areas, and creepy looking monsters and just an overall grim atmosphere when going through the 20 plus hours of gameplay. One example of how great the detail is, is when you are riding on top of a giant spider to solve some of the puzzles within the game and you can see that the abdomen actually looks like an animal skull, and that is just awesome detail work. I also love how well the cut scenes are executed. I mean, yeah, some can be a little long, like the one before the final boss fight, but there are some that just have a lot of charm to them, like the first time you meet the fallen god, Pan. The scene with him and Gabriel is just incredible, and in my humble opinion, is one of the best in the game. The voice acting is just amazing with everyone sounding perfectly to his or her character. It is no wonder, also, with such a huge cast of actors playing the roles. The list includes Robert Carlyle, Natasha McEchone, Aleksandar Mikic, Patrick Stewart (awesome! ), Grace Vance, Richard Ridings, Emma Ferguson, Eve Karpf, Adrian Schiller, Jason Sampson, Sally Knyvette, and Jason Isaacs. A big name cast with great voice acting. The titan fights are some of my favorite boss fights of all time. Yeah, you can say they ARE taken from the style of boss fights of Shadow of the Colossus, but really, who cares? They’re loads of fun, even if they can be a little frustrating at times. The challenge seems right, since I didn’t feel overwhelmed or underwhelmed by the challenge in the game. I also like the ending of the game. It’s delightfully dark and is a change of pace of “ oh, you save the princess! Ay, super happy fun!” Well, it isn’t happy, it’s depressing. Before I move onto the bad parts of the game, I want to just say this quick little comment about people saying, “ Oh, it’s not Castlevania”. Just shut it! I am sick of people saying it isn’t truly Castlevania. Yes, it was originally meant to be just Lords of Shadows, but I think it was smart to make it a Castlevania game. It is also interesting that it was going to be a Castlevania game all along, but Konami didn’t want to overshadow their other 3D Castlevania game, Castlevania Judgment (even though Judgment sucked). I mean, yeah, it doesn’t have the Metroid-style exploration, and doesn’t have all the stuff you nitpicky people want in a Castlevania game. It’s supposed to be a revamp! This means that they take things, like characters, and redo everything about the game and mix it with new elements. This will not be deducting the score I give for this game. Now then, let’s talk about the bad parts of this wonderful game. I felt like the camera control was a little weird, since it was taking the whole God of War approach. It doesn’t work sometimes due to enemies being out of your sight, but I never had a lot of issues with the camera. Another thing I didn’t like is that there was no map. Granted, the game is really linear, but sometimes I did by accident backtrack to the beginning of the level. My only really big complaint is with the final boss fight. It’s not that it’s “ Oh, I’m fighting Satan and not Dracula”, it’s more along the line of the first part being really tedious. That’s because there are multiple rings that have shadow and light magic in them. You have to keep swapping between the light and dark magic, and if you don’t time it right, you get launched backwards, and then you have to go through that process over and over again. One complaint I will agree with some people is that if you don’t finish off bosses correctly, that they regain energy. It is tedious at times, yes, but like I said, I didn’t have this issue of annoyance most of the time. I actually have one more complaint about the game; there are ONLY 3 titan fights! I wish there were more of them! Like I said, the titan fights are some of my favorite boss fights and I just wish they had more than just three of them. So, this is my review of Castlevania Lords of Shadow. I loved it. The story is dark and well told, the gameplay is fun and challenging, the voice acting is top notch, and it has fun replay value since you can re-go through ANY level of the game. Yes, it takes elements from other games for its own use, but it does it well. It’s like saying Uncharted 2 is not original, but it does take common elements like Castlevania Lords of Shadow and really makes it work. I say, if you are looking for a great action game then I say buy Castlevania Lords of Shadow and its limited edition form since you get a cool art book and a CD with the soundtrack. Was it game of the year? No. Was it action game of the year? It could have been, but all I know is this is one of my favorite games of all time.